First of all, I want to thank you for clicking on this blog post. I know it isn’t the most exciting topic, but I appreciate you letting me nerd out on you for a few minutes. There’s a change coming and it’s something that has the potential to impact your website traffic in a big way. Google is doubling down on their campaign for a more “secure web” and one big way they’re doing this is by marking HTTP websites as “not secure.” If you don’t want your website visitors to see a warning when they visit your website, you’ll need to switch to HTTPS as soon as possible. Why is Google cracking down on HTTP websites? Basically, they lack the extra layer of protection you get when you switch to HTTPS. It gets pretty technical here, but basically, HTTPS takes the traditional HTTP (a protocol that defines how messages are formatted and transmitted on the Internet) and adds a layer of security to it so when you send information over your site, it’s better protected. Everything looks the same and works the same, but the data is encrypted, which ensures only the server you intend to send the information to can read it. Even if your website doesn’t ask for sensitive information from your visitors, Google Chrome will still be displaying a warning to visitors on the address bar if you don’t switch to HTTPS. Chances are, people won’t stop to think about whether you’re accessing their information and how. They’ll likely just see the warning and click away. These days, we’re all super sensitive about our information being secure online, and a warning like that will probably spook your visitors. You can check to see if your website already has HTTPS by typing your URL into the address bar. If it loads with a lock icon and the word “Secure” before it, you’re good to go! If not, you will need to switch to HTTPS as soon as possible. In order to make sure you’re prepared for this change, you’ll need to add an SSL certificate to your server and move your website to HTTPS if it’s not already. This might sound complicated, but it’s not too bad, especially if you have a smaller website. Most people will just need to reach out to their hosting provider to find out the process and options that are available. 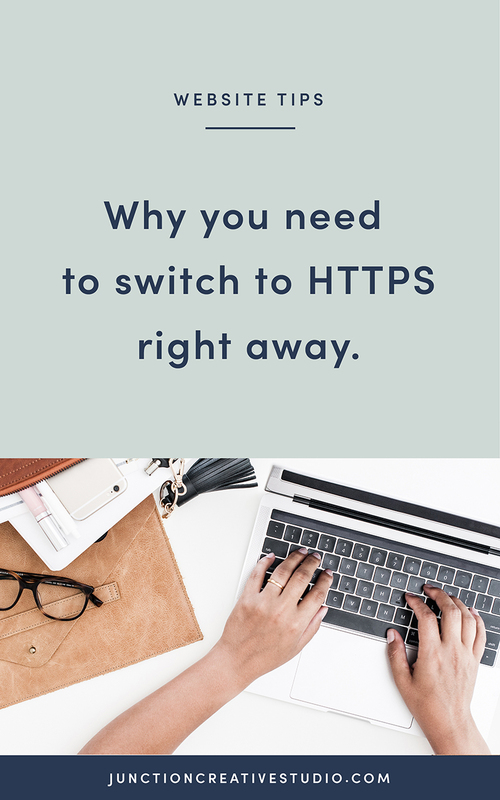 The switch to HTTPS will be a little trickier for those with a larger website, since it does have the potential to impact SEO rankings. Sometimes, pages can get lost or duplicated when adding the SSL certificate, which is why you want to call in a pro if you’re uneasy tackling it yourself. No one expects you to be an expert at everything – think about it this way; not everyone can do the amazing things you can do so effortlessly either 🙂 Don’t feel ashamed or embarrassed to let someone else take the technical stuff off your plate, especially considering how important it is for your business! If you’re a client of Junction Creative Studio, you can rest easy knowing that all of our website hosting and maintenance packages include free SSL certificates. If you have any questions or concerns about making the switch to HTTPS, please contact us and we’d be happy to help you with the transition!